Exam season is bearing down on us. 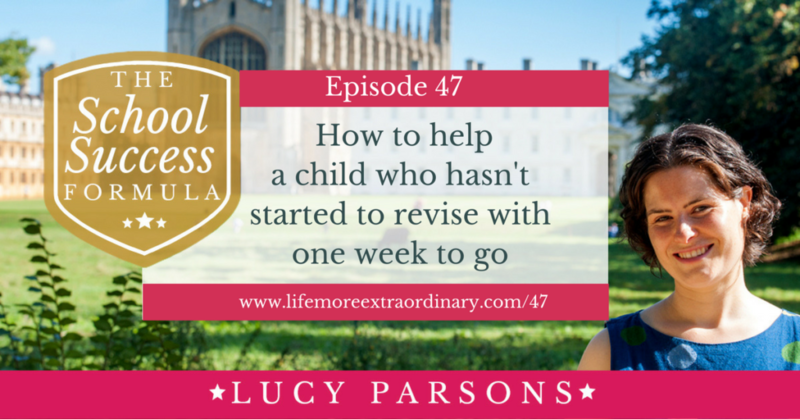 If your child hasn't yet started to revise you need to read / listen to this because I'm going to share with you my tactics on how to make last-minute revision count. But, first, a word of warning. I do not advocate last-minute revision or cramming. It is not a successful or optimal way to revise or prepare for exams. However, if your child has left it all until the last minute I hope these tips will help you and them on your way. (See my podcast, episode 37, on consistency and this one on the hare versus the tortoise approach). If your child has been following all my other advice up until now, see my blog post on How to Revise With One Week to Go. 2. Once you feel you have a grasp of why they're not revising sit down and try to get through to them that now is the moment to start. It's important that you approach this through the lens of why they're not revising in the first place. If you go in there, all guns blazing, telling them they have to revise when they don't actually know how, no matter how loud you shout, how many doors get slammed or how many restrictions you place on them, you're not going to get anywhere. Your child is almost certainly facing the biggest test of their lives (unless they've already competed in the Olympics) and they will be nervous to some degree. If they've left their revision until this late stage it's almost certainly a cry for help. You might say, “Well, Lucy, I've been offering help since last September and all they do is ignore me.” If this is the case, you might want to think about asking them what kind of help they want from you. 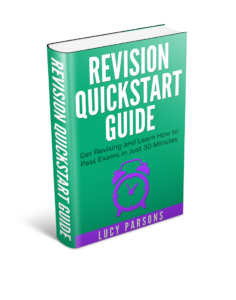 My Kindle book, Revision Quickstart Guide, teaches you how to revise in around 20 minutes. Once you're clear about why your child hasn't been revising and the kind of support they'd like from you you'll want to make a plan. If your child really hasn't done any revision at all until this stage, I would advocate a slightly different approach to revision planning from what I would say to the long-term, conscientious, consistent revisers out there. Plan to do the revision that will make the biggest difference in the shortest amount of time possible. threats to their overall achievement. Strengths might be their ability to remember mathematical methods without much prompting. Weaknesses might be not knowing any quotes for their English Lit exam. Opportunities could be putting a little bit of work into a couple of really useful geography case studies to push their grade over the line from a fail to a pass. Threats might be the lack of notes they have to revise from for geography, or the fact that they just can't leave their mobile phone alone. Taking the above student as an example, I wouldn't waste any time on maths. For English, I'd identify five quotes for each text and spend five minutes three times per day learning the quotes. I would also phone their geography teacher and ask for the two most useful case studies they've done – one for physical and one for human, so that they can be learned at home. Finally, I'd set some strict boundaries around phone use for the duration of exam season. Next you'll want to set a study routine – how many hours study, from what start time to what finish time, they need to do over the next week. Also create a plan for self-care e.g. when they're going to bed and get up, what meals you're going to provide and when they're going to get fresh air and exercise. Put this into action by agreeing with your reluctant reviser a post-exams reward for a certain level of effort applied. You might agree that they're going to study for three hours every night after school and six hours each day at the weekend for the rest of exam season. If they do this, they get something they really want once exams are over. It's really important to link effort with rewards, rather than simply results. Afterall, effort applied in the right way gets results. You need to train your child to equate effort with pleasing you and commensurate rewards. Once you've set up the plan and got your child going with some kind of revision keep checking in to review how they're doing, what obstacles they're facing in getting their revision done and how well they're doing in working towards their reward.